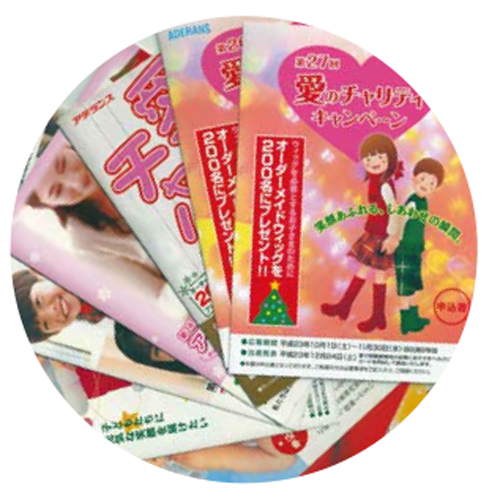 Through our hair-related business, we have continued to make efforts in various activities, both domestically and outside Japan, as we consider ways to spread smile and joy not only for our customers who use Aderans Group products but broadly across society. The Love Charity was introduced in 1978 to provide custom-made wigs to children aged 4 to 15 who have lost their hair due to some sort of trauma, such as sickness or injury. The underlying concept of this campaign is to prevent the physical trauma of hair loss from becoming an emotional scar as well. The Love Charity Campaign is an opportunity to bring smiles back through the gift of a custom-made wig. Furthermore, as of September 2012, we have decided to conduct throughout the year our campaign that had previously been limited to the Christmas period, for the happiness of greater numbers of children. Also, from 2014, we started to provide ready-made wigs to children who need wigs immediately. We have continuously conducted "Christmas Santa Project" for more than 30 years. This project is for children who need to stay at hospitals during the festive season and we visit hospitals to give them presents. In 2017, we visited 27 hospitals in Japan. 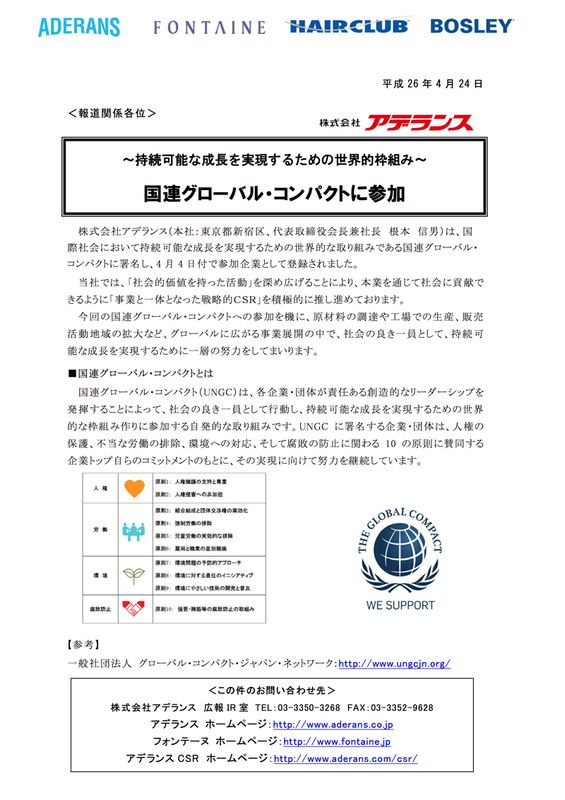 We have started support for JHD&C, NPO JAPAN HAIR DONATION & CHARITY, from March 2015. We offered our Aderans salons as places for those who look for wigs. It could be used to measure their head sizes and collect their customized wigs there. Also, we provide aftercare services such as shampooing and haircut at discounted price for those who use JHD&C's wigs. Starting from April 2016, after receiving a request from JHD&C, we started collaborating in making new wigs. We strive to provide speedy and high quality wigs for children who need them along with Komachi Center Co., Ltd, which is a long-established wig manufacturing and sales company founded in 1925. We supported summer events which were hosted by JHD&C, to have parents and children know more about hair donation. We provided wigs and assisted participant to fit wig. "Vending machine supporting hair donation" is a vending machine that JHD&C and Coca-Cola Bottlers Japan Co., Ltd. operate together. Part of the sales are donated, and that can be used for making wigs. In August 2018, we installed this vending machine at the AD headquarters building. The World Quality Company supports kindergartens and elementary schools located near the factory by assisting with the expenses of school lunches, textbooks, and reference books. Joanna Rowsell Shand MBE is an English cyclist on the Great Britain Cycling Team and was diagnosed with alopecia. She came in to one of Aderans UK shops looking for a wig for the Olympic ceremony. Aderans UK gifted her a custom-made wig for the ceremony. Also, Aderans UK gifted her a custom-made wig for her wedding in July 2015. Her wedding became a hot topic for conversations because of the Britain's popular magazine "Hello". Acting as a wig ambassador for Aderans UK, she attended our event for further understanding of alopecia areata when she came to Japan. In the sports world there is the phrase: "concentrate on what you can control." She provided inspiration and courage to attendees with the message: "I was devoted to bicycle competitions that I could control. Wigs helped me have more confidence, allowing me to live positively despite my alopecia." In stores, we think about customers and practice ways to satisfy them. At the Hair Salon Komorebi Kyushu Cancer Center store, because it seemed uncomfortable for customers who have undergone throat surgery to wear cut gowns, the staff made chair arms by themselves and attached them to the chair where customers were seated. This way, it is not painful for the customer during the treatment anymore. In nursing homes, we are supporting a fashion show that uses wigs. 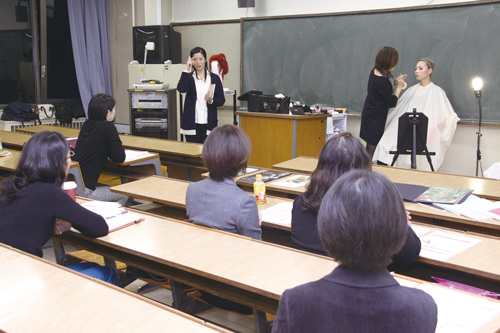 In October 2014, in collaboration with Medical Corporation Association Ishibashi Clinic (Headquarter: Himeji, Hyogo), we held a wig fashion show for daycare service customers. (UK)Held "Ladies Night Charity Fashion Show"
Aderans UK held a CSR event, "Ladies Night Charity Fashion Show," in Brighton, England. The "Ladies Night Charity Fashion Show" was held with the aim of telling society at large that there are many people who suffer from hair loss, and calling for support of them. Held "Ladies Night Charity Fashion Show"
Aderans Taiwan Co., Ltd. donated exhibited sample items from stores to hospitals in Kaohsiung City in 2017. While seeking to open hair salons in the hospital, in Taiwan, we found that there was a demand for free rental of wigs, and we decided to donate them for rental. In 2018, we donated 10 wigs and 20 hats for hair removal to hospitals in Taichung City. 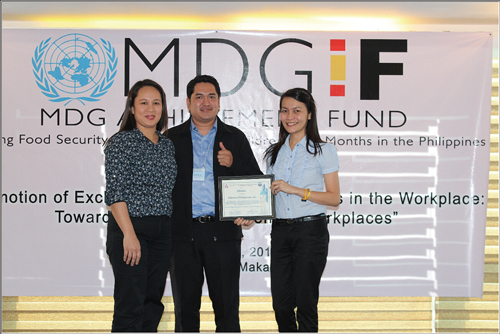 Aderans Philippines, Inc. was commended by MDG ACHIEVEMENT FUND, which is under the Department of Labor and Employment in Republic of the Philippines, for our diversity in the workplace environment for employees in 2013. Typhoon Haiyan devastated the central Philippines in November 2013. 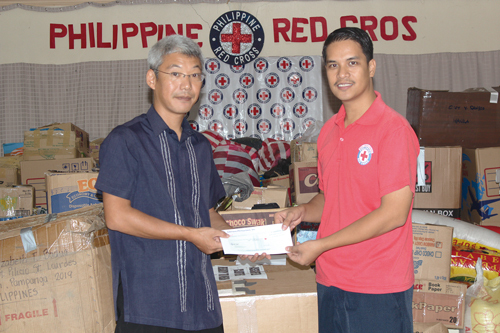 Aderans Philippine, Inc. (API) donated to the local Red Cross for disaster victims in response to the crisis. In addition to donations from employees, we provided precooked foods such as instant noodles to local television stations. Support for typhoon victims in the Philippines. Kaneko API Factory manager. Human hair has been always used for the custom-made wig. Aderans Group has carried out research on artificial hair since 1983 due to the difficulties to secure a stable procurement of human hair. With successful development on its quality akin to that of human, artificial hair has been used for Aderans' products namely "Cyber Hair" and "Vital Hair" since 1990. 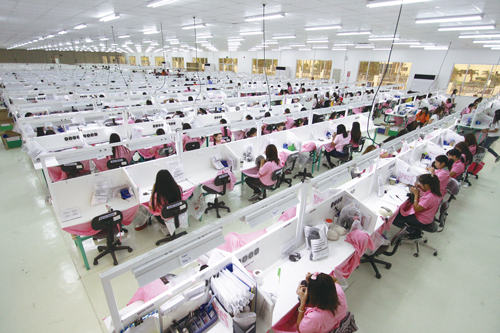 The second production plant was completed in October 2013 in the Philippines. We added up to 1,200 new jobs at this factory. Aderans Laos Inc. has been established in May 2014. It is the next production base after ones in Thailand and the Philippines. The Savannakhet production plant was completed in July 2015. This plans will create 3,000 new jobs in Laos. We are aiming to create new jobs and improve labor environment. Since April 2014, Aderans Group has participated in the United Nations Global Compact. To meet its principles,Aderans Group takes advantages of the strength to tackle social problems as a role of a globally integrated enterprise that contribute widely to society. Our challenge is to create a more sustainable society. Visit by the Governor of Florida, U.S. Governor of the State of Florida Rick Scott visited the Aderans headquarters in November 2013. He showed high appreciation for our implication of in-house salons at hospitals and job creation by our purchase of Heir Club, a U.S.-based company. We began supporting "Healthcare Academy," hosted by Cancer Fitness, General Association. Cancer fitness is an organization that engages in activities such as support for physical fitness, and self-management after cancer treatments. Their slogan is "Let's exercise when you have cancer." They hold a variety of “exercise classes” for cancer patients. Also, the “Healthcare Academy” is where you learn how to manage your health to improve the quality of your life after treatment. In cooperation with Cancer Fitness, we held events for cancer patients, such as "Health Care Course," "Moving Body Creation Course," and "♥ Cinderella ♥ Afternoon Party" at our stores. Aderans Group is a proud supporter of the Pink Ribbon Campaign, which comprises activities aimed at driving home the message about early detection, early diagnosis and early treatment of breast cancer. Pink ribbons are distributed to all employees, and a stand featuring the pink ribbon symbol of the campaign is set up in the lobby area of all offices to encourage wider recognition of the campaign among employees. Many employees voluntarily participate in the Pink Ribbon Smile Walk. In our endorsement of the activities of the support group “One World Project”, which delivers care products such as wigs for medical uses for cancer patients who had been affected by the Great East Japan Earthquake, the Aderans Group has begun a “Maintenance Support Service” for wigs. In this service, we provide maintenance support for the wigs that have been donated by the support group so that they will maintain their good fit for longtime use. At first, this support service was planed to end until June 2014. “One World Project” staff requested us to continue this service. Therefore, we decided to postpone the end time of this service. By leveraging the high standards of technology possessed by our company for handling wigs and by making use of our barbering and hairdressing skills, we would like to continue to be of service for the people who have been affected by the disaster. Tokyo Metropolitan organized “Distinguished Company which arrange work-life balance of cancer patient in employee”. We received the Encouragement Award. Tokyo Metropolitan appraised our action, such that there were no retired person employee on the grounds of cancer. We hold an event with Team FC Osaka on September 2016. In the event, we sat our pink hair extension to about 300 children and their mother who came to watch a soccer game. In the US, there are non-profit charity organizations that support patients who need wigs for cancer treatment. Aderans Hair Goods, Inc. supports activities by providing wigs to those groups. For patients who are unable to purchase wigs, for the last ten years, we have been continuously supportive by using wig manufacturers' strengths. In 2016, we offered about 4,000 wigs to 14 organizations. “My New Hair” is a charity organization for people suffering from cancer and medical hair loss, set up by world class hair stylist Trevor Sorbie. 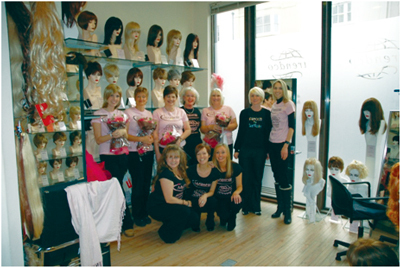 Aderans UK, our group company in the United Kingdom, supplies wigs to the charity and provides coaching to beauticians in providing hair cuts. On June 11, 2012, a ceremony was held in Thailand, one of the manufacturing bases for the Aderans Group, to donate wigs to hospitals and other facilities. The wigs that had been tried on at factory had previously been discarded due to operational issues, but the Aderans Group was able to donate and make use of these wigs. We have been donating wigs every year since 2012, in association with our wig production plant in Thailand. In 2018, we donated 270 pieces to 3 hospitals. Since the start, about 2,164 wigs have been donated in total.